If stepping away from the computer gives you StarCraft II withdrawal, an app developer wants to help. An application in development for the iPhone and iPad will give players remote control over their StarCraft II matches through the portable devices. The StarCraft II Gameboard will reportedly hook up to a Windows PC with a USB or wireless connection and provide every function required to slay the Zerg with no mouse and keyboard in sight. Its development team of two says the StarCraft II Gameboard will give "complete control" by providing unit stats (including strengths and weaknesses), hotkeys, and touch access to the mini-map. They assure users that it's not a hack, and instead more of a replacement to the keyboard. It works by interfacing with client software than can be downloaded to any PC that has Windows XP, Vista, or 7 installed. Mac support will be added if there is enough interest. Current images are supposedly not what the final interface will look like, and just mock-ups. The developers actually say their app is an "easier way to control game functions" than the usual method, but we'll have to wait and see. I'm all for alternate control schemes that get us away from the keyboard and mouse, if they work, so hopefully the Gameboard will show us what can be done. 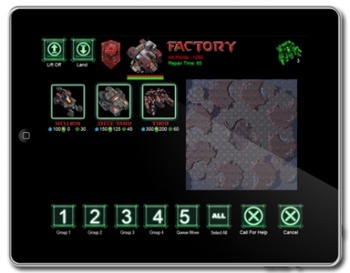 The StarCraft II Gameboard is planned for release on the app store in mid-September for $2.99.